Spas of America, the fastest-growing spa travel website, today announced their annual ranking of the Top 30 Spas of 2008, based on consumer traffic on their website. Spas of America president Craig Oliver says, "This year's list is a unique cross-section of Spa & Wellness experiences from across North America, including resort, hotel and destination spas from the United States, Canada and Mexico." Over 650 spas are featured on the Spas of America website, and the Top 30 list represents the top 5%. "Many of the spas making our list for 2008 are long-time established properties, with a solid track record of providing extraordinary Spa & Wellness experiences to spa travelers around the world. For 2009 we expect this trend to continue, with consumers attracted to unique experiences, well-earned reputations and value. Even -- perhaps especially -- in economic downturns, consumers realize the value of Spa & Wellness as a benefit to their overall well-being". This year's list is a unique cross-section of Spa & Wellness experiences from across North America, including resort, hotel and destination spas from the United States, Canada and Mexico. Topping the list for 2008 is the 100 Fountain Spa at the Pillar and Post set in charming Niagara-on-the-Lake, Ontario. The 100 Fountain Spa is located in the heart of Niagara's wine region, a year-round destination offering a wide range of cultural and recreational activities, only minutes from majestic Niagara Falls. Number two is the Homestead, situated in the scenic Allegheny Mountains of Virginia. 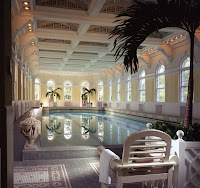 Built in 1892, the Homestead Spa is one of America's most historic luxury spas, still fed by the original hot springs that have attracted travelers since the 1700s. Third place honors go to the Fitness Ridge Resort & Spa in Ivins, Utah. Set amidst the remarkable red rocks of southwestern Utah, Fitness Ridge is categorized as a "destination spa," offering a one-week-minimum, results-oriented health, fitness and weight loss program. America also includes Mexico, so please check out www.spamexico.com for some deals that include what is really 5 star spa services, with 3 star prices! Ixtapan Spa Hotel and Golf Resort is a 60 year old affordable and reliable spa with a US reservations number at 1 800 ixtapan.